Penguins, Apples, Turtles ... this show had it all. I haven’t posted anything about Mawaru Penguin Drum in a while, so some might have wondered if I dropped it. No. I have been eagerly watching each week, but found myself perennially at a loss for words. Normally, especially for a series that I enjoyed as much as I enjoyed this one, this post would be my “Final Thoughts”. I would be summing up what I thought about it, and telling you why I think you should watch it, or at least who might enjoy it the most. But with Mawaru Penguin Drum, I am by no means ready to express “Final” thoughts. I strongly feel the desire to go back and watch the series over from the beginning. In fact this, I think is key to understanding the experience of watching Mawaru Penguin Drum. 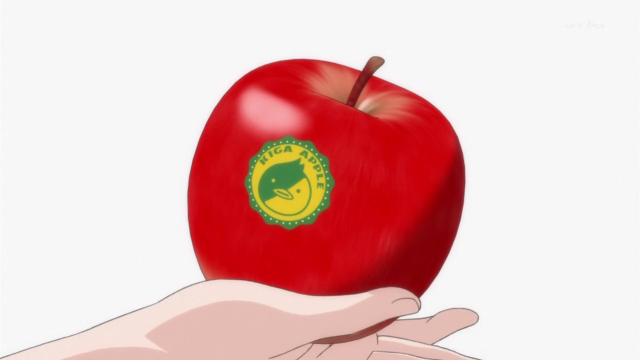 What does that have to do with an apple? Some shows are enjoyable on the surface. You see something beautiful, or experience strong emotions, and there is no need to obsess over why you like it. Mawaru Penguin Drum isn’t like that. This is the sort of show that doesn’t just reward “going deeper”, it seems to DEMAND it. 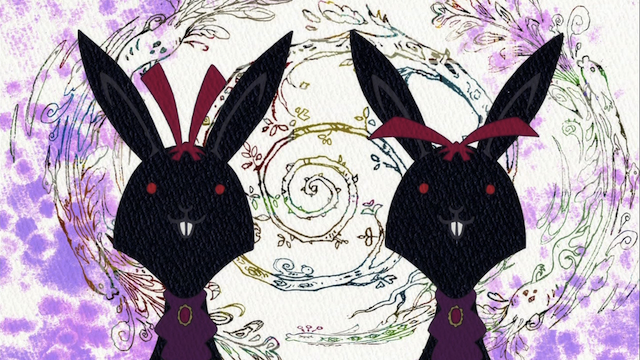 In a sense one might say that the genre of this show is symbolism. I don’t just mean that it is surreal. 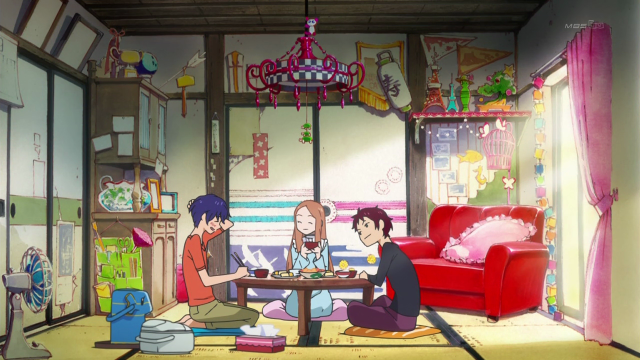 I mean, whereas other shows operate in a genre like Adventure, Mystery, or Romance, Mawaru Penguin Drum operates in a genre of symbolic manipulation. There certainly wasn’t an episode in which some sort of intense symbolism was waved around, but even more, plot, character names, recurring dialogue, props, background details … almost everything seemed to simultaneously demand and resist interpretation. 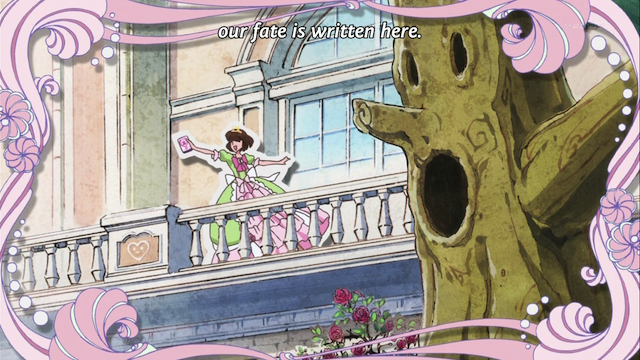 Maybe this is Utena after all. Now, I would have to say that I was at least somewhat prepared for this, because I had already watched Revolutionary Girl Utena, a previous work by director Kunihiko Ikuhara. 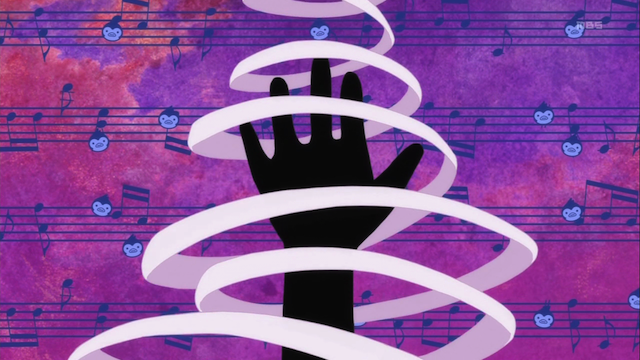 Utena was also dripping in symbolism, that sometimes outright defied rational interpretation, even as it set the mind racing. Now this might sound difficult to understand, and it is certainly true that Mawaru Penguin Drum keeps the audience guessing, but it also keeps the audience engaged. Even if a twist comes out of nowhere — something that can easily happen if the twist operates in symbols that seem to be masking every hope or horror we might have about reality — the twist is presented with so much conviction that the audience is carried along without fully being sure of what it was to which they have epistemically assented. Part dark fairy tale, part religious revelation, Mawaru Penguin Drum is ultimately about choices. Now when this show started, I was immediately impressed and even stated that this series might leap to the top of my favorites. There are a few requirements that I have for considering an anime one of the greatest of all time. Most important is that it has to try to teach us something. I demand A LOT from a truly great anime. I don’t just want to love it. I also want to feel like I must submit to it. It should grab me by the shoulders, shake me, and point out the errors of my ways. This is the sort of thing that keeps a show like Cowboy Bebop out of my top 10 list. Does Mawaru Penguin Drum have what it takes? I do think it moves beyond “mere” entertainment. The show tackles issues that I could not have imagined being raised at the outset: the nature of Family, the cruelty and abuse that children can experience, and Fate. Fate, for example, is looked at from many angles. Does Fate exist? Is it good or bad? And instead of giving a single answer, these questions are answered again and again but with different contradictory answers. People looking at Fate see its nature differently than others, and even differently than themselves at different times. 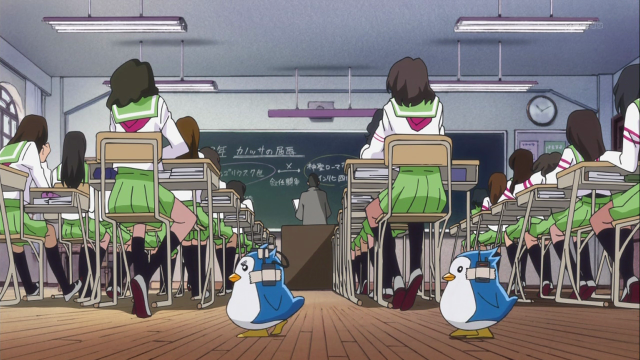 Mawaru Penguin Drum isn’t the sort of show to hand out easy answers, (and honestly these kinds of questions don’t have simple answers) so the various serious issues that are raised challenge the audience to think about them. The Takakura siblings (left to right): Shouma, Himari, and Kanba. I just said that the same characters end up looking at some of the big issues very differently at times. This is a good indicator that the characters are very dynamic. Characters who appear sweet and good-natured are shown to have selfish impulses. Characters who seem deranged and psychologically unhealthy can grow into good people. Very few characters have simple roles to play. This complexity of characterization is a real strength. It gives the show a mature awareness of the fragility of the personae that people present to each other in their everyday lives. It also means that, without warning, social stability can come crashing down. The characters fit together as an intricate puzzle, and when one or more fails to live up to the persona that stability is founded upon, the whole of society can be thrown into turmoil. I guess I should say something about the penguins. At this point I am willing to classify them under the aforementioned symbolism that resists interpretation. I have no doubt that they existed within the story as physical beings, but I think they also didn’t in a way. Ultimately they are just an example of how Mawaru Penguin Drum operates in between fantasy and reality, with one foot in each. Ringo's deranged fantasy world overtakes reality. So it is very easy for me to recommend Mawaru Penguin Drum, particularly to those who are willing to be challenged. This isn’t a show for mindlessly watching, even though it does have very bold visual design, and the crazy plot twists can make for an exciting viewing experience. Despite the silliness that seems to operate at the surface, it is a fairly serious show that deals with the rather tragic nature of the human experience. Horrible things happen regularly, but they often are handled with symbolism so that the depiction isn’t graphically brutal. Nevertheless the consequences in a real world are obvious to the viewer, and can’t help but have an impact. The bird cage rusted shut that day. Which leaves me with the question I started this series wondering about. Not WOULD this be a great series, it was destined to be one from the very start, but HOW great would it end up being? I’m sure it doesn’t make it to the top of my all-time favorites. Haibane Renmei is still the greatest show ever made. Mawaru Penguin Drum took 24 episodes to spin its tale, and though I felt compelled to consider a lot of serious issues, its open-question style gave me an opening to NOT learn. Haibane Renmei FORCED me to learn, and did it in only 13 episodes. Nevertheless, I consider the experience of watching Mawaru Penguin Drum to be a profound one. I certainly will be rewatching it, and thinking more about what it means, and considering where it fits in the big scheme of great anime. What might be most interesting is to read this post again after you post your thoughts after rewatching the anime. It might be fun to see what your initial thoughts are after watching the anime once and how they compare to your thoughts the second time around. 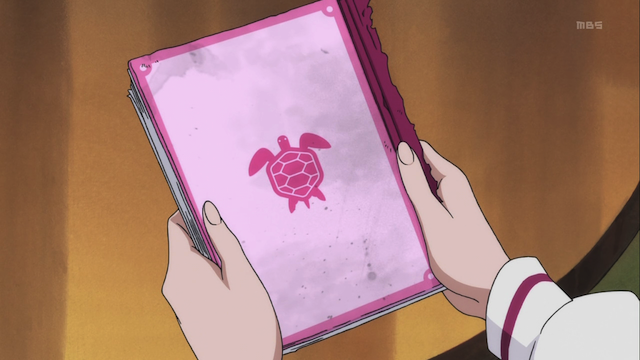 You’ll catch all the minor details now and recognize the symbolism easier the second time around so you’ll have a more coherent and true idea of what the anime is trying to get at and when you match that up against this, you’ll see what the series tried to make obvious (thoughts on the first watch) vs what the series tried to make subtle (thoughts on the second watch). Are you planning on rewatching it soon? I’m not planning to rematch it soon, but I am planning to rewatch it for sure. I just started rewatching 12 Kingdoms again, despite having already watched it several times straight through. I own it on DVD, but bought the first BD set. Absolutely wonderful. Now I want need to buy the next two BD sets, so I can pass my DVD set off to someone (probably my sister). I also have an urge to rewatch RahXephon again some time soon. Great shows can stand up to it, and I am sure PenguinDrum is in that category.